Cornelis de Vos was an artist who focused on history painting. However, portraiture was also important within his oeuvre, and he produced both individual and group compositions, introducing interesting innovations into the latter type. De Vos was one of the most favoured portraitists among the wealthy Antwerp burgher classes, particularly in the 1620s when this panel was painted. 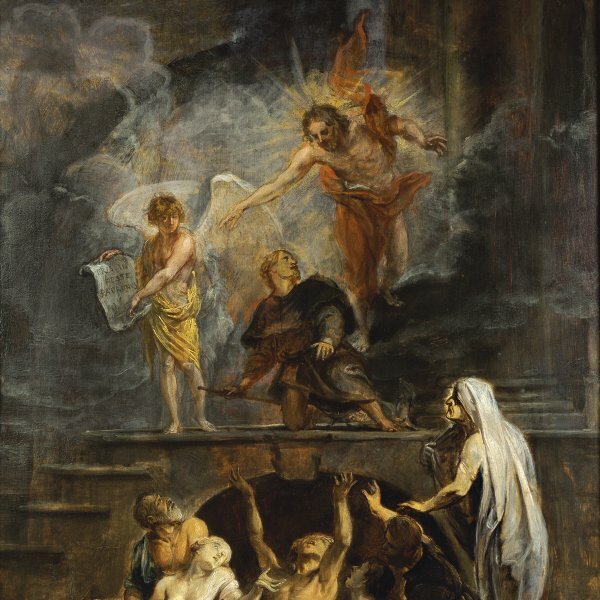 The influence of Van Dyck on the evolution of the artist’s style and figure types is evident. As Sutton noted, this is more so with regard to external elements that indicate the social classes of his sitters than in any refinement or grace with which De Vos might have depicted them. At this period De Vos was particularly influenced with regard to his female portraits by Van Dyck’s portrait of his sister, Margaretha de Vos, the wife of the painter Frans Snyders (Frick Collection, New York). This canvas, which dates from around 1620–21, prior to Van Dyck’s departure for Italy, was the inspiration for a series of female portraits by De Vos including this one of Antonia Canis. The artist presents his model seated in an interior that opens onto a landscape with two columns on the left and a heavy curtain on the right. 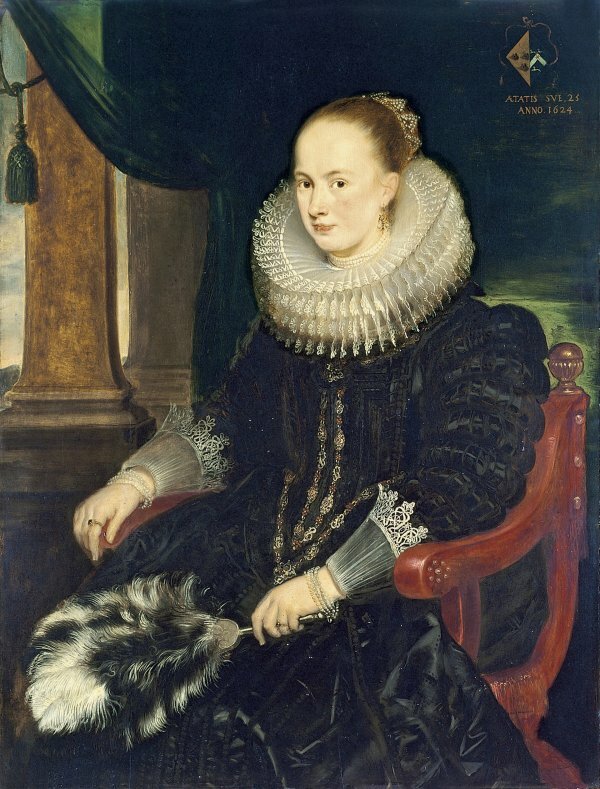 The position of the hands, one resting on the arm of the chair and the other on her knees and holding a large and striking feather fan, the position of the body and the slight turn of the head that allows her to look directly at the viewer are all derived from Van Dyck’s portrait of Margaretha de Vos. However, the artist has modified the background and simplified it in comparison to Van Dyck’s original. This same compositional formula, but with the fan replaced by a handkerchief, is found in another work by De Vos in the collection of the duque del Infantado. Ludwig Burchard identified the present sitter through the coat-of- arms at the upper right, next to her age and the date. The same coat-of-arms appears with the names Antonia Canis and Jan van Eversdtck in a stained-glass window donated by the couple in 1623 to the Carmelite church in Antwerp. Designed by Abraham van Diepenbeeck, it depicts Saints Joachim and Anna. The left half of the coat-of-arms in the present panel, with three stags’ heads, is that of the present sitter’s husband, Jan van Eversdtck, while the right half, with three dogs and a red star, is that of the Canis family. The present panel was acquired from Rudolph Heinemann in Munich in 1935. Some years before, it had been with the Antwerp dealer Sam Hartveld and with the London gallery Asscher & Welker. It had also been in the Gaston Neumans collection in Paris.